With the changing of the clocks and the move into Spring it's no surprise that we're getting April showers. So as you're running away from the crags due to the nasty rain, what will you get when you come visit The Climbing Works? 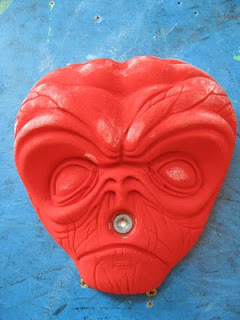 New last week we set 2 circuits in the Font 6a-6c'ish range. The Blacks will test your open hand strength while the Purple / Pink spots will most certainly get your fingers working. This morning we've taken down the old Greens and we'll have a new set going up on Wednesday. We're also planning to set a Red circuit but at the moment we're delayed waiting for some new holds to arrive. We've got a number of resets planned for April so keep an eye on our Twitter account for all the latest news. You can see the latest topo for the Works cirucits as a pdf online here. April also sees Easter arrive and with the schools setting your kids free for a few weeks we've got a number of activities and sessions lined up for the whole Family. Read all about our Easter sessions on the website. For those who enjoyed our revamped Adult Improver sessions over the last few months, we're doing it all again. First time climber or someone who's looking to break into the 7's, you'll find a session for you. Check out all the details for each session on our website.